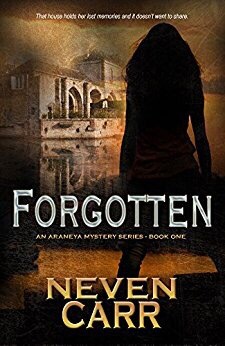 An enjoyable read, the first in the exciting ‘Araneya Series’, involving a ruthless band of Italian-Australian ex-Vietnam Vets out to silence a child witness when it appears that her trauma-induced lost memory might be returning. Then she senses that she is being followed, and when a second killing takes place, her world of family warmth and trust begins to fall apart when she realises that her beloved Papa is also not what he seems to be. Secrets begin to shatter, and ruthless men will go to any lengths to prevent them breaking open altogether. A big thank you to Karen over at My Train of Thoughts On! Every family holds a secret. How far would yours go to keep it? Twenty-eight year old schoolteacher, Claudia Cabriati, has no memory of her life before the age of eight. This is not something she thought unusual, until a strangely familiar woman possessing knowledge of that life, is shot and killed in the grounds of Claudia’s home. Another brutal murder follows, along with the heartbreaking revelation of an unimaginable family conspiracy. Claudia crumbles into a world driven by fear and the irrational need to run and hide. Why were people suddenly dying around her? Were any of her family, particularly her much-beloved Papa, involved in their deaths? More importantly, would her life be next? Claudia Cabriati has no memory of her childhood before the age of about 7 or 8. Raised in an overprotective Italian household with a doting father, a somewhat standoffish mother, three brothers and a large extended family she has been convinced this memory lapse is nothing to be concerned about. But as an adult, she begins to question that notion. Do her recurrent dreams have anything to do with it? And what about the nameless, faceless individuals she perceives following her, watching her from a distance? When bodies start to turn up in Claudia’s vicinity, and I mean A LOT of bodies, the possible connections become impossible to ignore. Latest Review from Peachy Keen Book Reviews. Thank you Ashley! “A young boy is shot and one of the members of an elite gun clan takes his own life. The truth behind what happened lies only in those present, and in the forgotten memories of a seven-year-old child, Claudia Cabriati. Fear and the bitter stench of death have haunted Claudia for much of her life, even now as a grown woman, along with odd dreams, puzzling cards and the bone-chilling sensation of being watched.